One day prior to her birthday, Kim has already received her birthday surprise from her husband, Kanye West. Surprise, Surprise! Kim woke up to a romantic gesture of her husband surprising her with an array of exotic flowers displayed in her house, along with a pianist playing romantic music for her. The magenta sizable floral display filled up one of the large all-white rooms in the couple’s California home. Kim felt overwhelmed and so took to her Instagram story on Saturday morning to share a number of brief videos of her surprise. 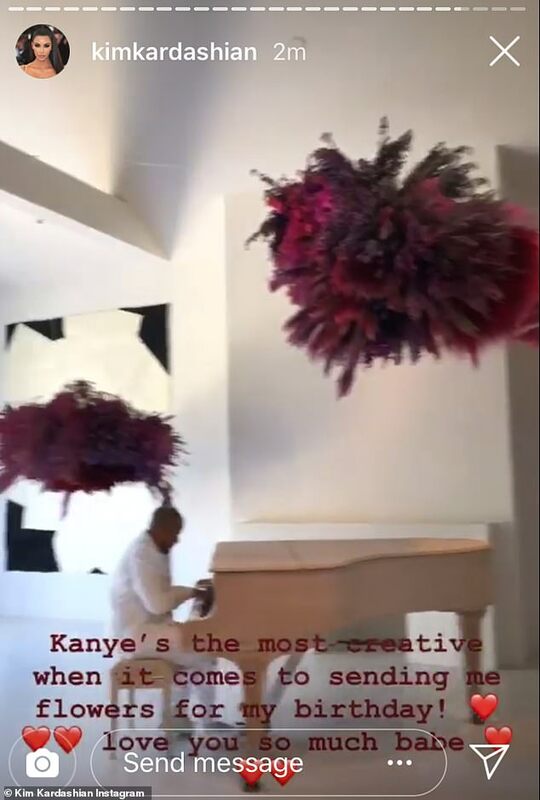 Kanye also took to Twitter to share his own video of the floral display and the pianist, which included their kids North and Saint playing in the background. It isn’t the first time Kanye has shown his romantic side to his wife. Kanye has surprised her with elaborate floral displays on other occasions such as their wedding anniversary in 2017 and Valentine’s Day the same year. Kim was also gifted with a $1 million check on a Mother’s Day. Life is definitely good as it is for Kim. Kim was also flooded with birthday wishes from her family members with video dedication on the social media. As we all know, this is just the beginning. There’s sure to be many other birthday gifts from Kanye coming up for Kim. Let’s wait and watch!